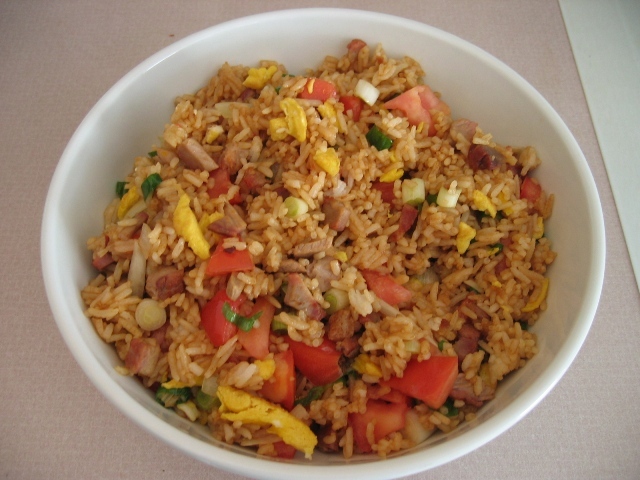 I find chow fan (Chinese fried rice) to be a most boring of dishes. Maybe it’s the Asian in me that feels like it’s a bit of a cop-out kind of dish: It’s something you throw together with whatever you can find for a meal because you don’t have the time or want to make the effort. Everything will taste great together in fried rice. Fresh ingredients not required. In fact, it’s the best way to get rid of left-overs. (Perhaps that’s why I always stay away from fried rice dishes at Chinese restaurants.) I guess it at least makes for a decent packed-lunch when reheated the next day.